The Best of the UK Set Gets the Best Tag Team. Welcome Mustache Mountain! 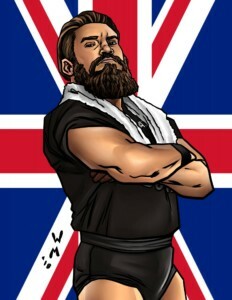 When it comes to the United Kingdom indie tag team scene, few teams can measure up to the accomplishments and the skill of Mustache Mountain. The team of the burly Trent Seven and the young phenom Tyler Bate may seem odd, but is a duo that works amazingly well. The pair has won all the major UK tag team championships and even won the CHIKARA Campeonatos de Parejas. Now that the have won over the UK audience, they are ready to take over on wrestling’s biggest stage! 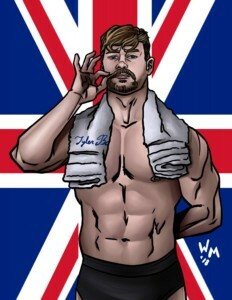 Mustache Mountain joins Zack Sabre Jr., Mark Andrews, Travis Banks and Flash Morgan Webster as part of the 8-card Best of UK Wrestling game pack. The set will debut on July 14 at GalactiCon in Pittsburgh, and begin mailing worldwide soon soon thereafter. Presale begins in the next week. Get ready to add the best of the UK scene in your indie promotion! ← Scorn Brings a New Look and Attitude to Kingdom Come 2134!